One staple of the CFC-Style Fan Books was the feature “Uchihirano 3rd Block General Store”. Named after Capcom’s headquarters in Osaka, Japan, this continuing column provided Japanese fans a chance to look at rare Capcom paraphernalia, forgotten things from Capcom’s early years or merchandise that was only released in certain parts of the globe. 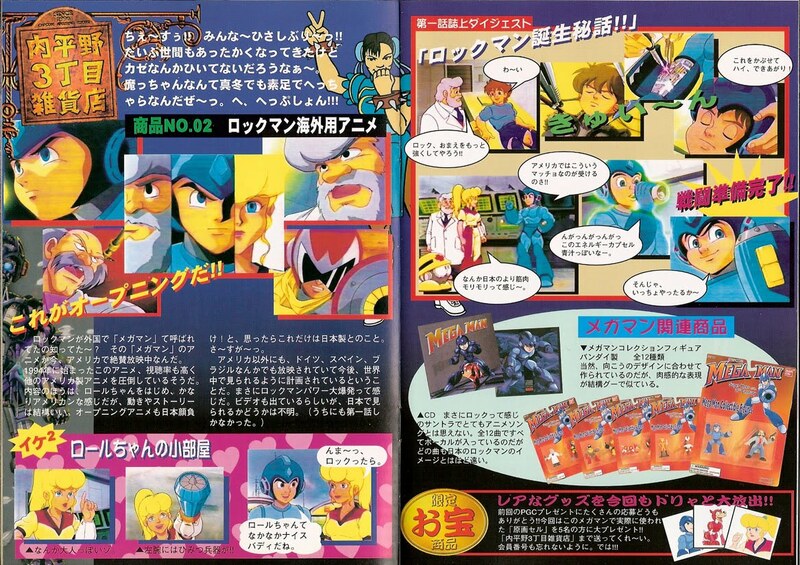 Narrated by Capcom’s own Ma-chan, the section usually included a bonus giveaway contest at the end where you could enter to win rare Capcom-related goods. In CFC’s third volume that released around the springtime of 1997, “U3GS” did a feature on the Ruby Spears Mega Man cartoon. You might be surprised… or not. Hey everybody!! Long time no see!! As things are warming up, a lot of people out there are catching cold. But old Ma-chan never has to worry about that, I’m always cool as midwinter! …Ah- ACHOO!!! Did you know that Rockman is called “Mega Man” overseas? Right now in America, “Mega Man” is critically acclaimed animated television show. This anime started airing in 1994, and I understand it received much higher ratings than other American-made cartoons. The style of the show, starting with Roll, has a real American feel to it, and the story and animation are top notch. Even the opening animation puts Japan to shame! Or so I thought, but this is actually the only thing that was made in Japan. Su~perb! Roll is looking very adult! Her left arm contains a secret weapon!! Naturally, these figures are modelled after the foreign design, but the quality looks splendid, and their sensual expressions are priceless. This strange feeling Rock soundtrack is like nothing you’d expect for an anime song album. The 12 tracks all feature vocals, and not one of them is anything like Rockman’s image sound here in Japan. We’re once again giving away some rare goodies!! Thank you everyone for the tons of entries we received from our last giveaway where we presented PGC cards!! This time for our bonus prize we’ll be dishing out 5 actual “original cells” used for the Mega Man anime!! So get your entries sent out to “Uchihirano 3rd Block General Store” right away! And don’t forget to include your membership number! Ciao!!! I was somewhat amazed (but not too surprised) to learn how little Capcom’s Japanese side knew about the Mega Man cartoon. Even years after the show’s debut, they’d only seen the pilot episode? Some might call that fortunate. By the time this article was published the show’s production was already canceled and re-runs started being regulated to “filler” time slots on many channels, but I can’t tell whether the writer was aware of that or not. Overall, Ma-chan gives off a sense of being alternately impressed and bewildered by the show, which I think fans on our end of the globe have also expressed. Perhaps when it comes to the fanbase we’re not so different, even if our versions of Rock and Roll definitely were. 5 Comments to "The Mega Man Cartoon: A Japanese Perspective"
After reading that article, I'm relieved that Ma-chan didn't bash RS-MM for not being like the games (which is what every US publication about games did). Still, rather disappointing that only the pilot was aired…that would imply a lack of interest on either the audience's or distributors' part, I think. I feel dirty now. I'm going to go eat lunch or something. Ha ha, sorry Doc. I wasn't really sure what he meant by that either. Hey RADIX, I owe you an apology man. I didn't catch up on my email until last night, so I had totally missed your request! It's really a crazy coincidence that I wound up putting this up this week. It must be great minds thinking alike. But to answer your question, the first episode was shown to Capcom Japan staff, but I don't think the rest of the show has ever been aired on Japanese TV or released in stores there in any form. I think I did hear about them showing some clips from it at Capcom events in the 90s. I'm not really sure why they never brought it over. And that's a shame. 🙁 Maybe CoJ wasn't interested enough/didn't want the expense of dubbing it. I’m surprised Ma-Chan didn’t mention that Mr. Big was on the soundtrack. Mr. Big were very popular in Japan from what I know.